So you just got Laserfiche and you’re excited to fill the repository with hundreds of documents. But wait! Before adding content into the repository, it’s important to think about how to find it later. One of the best ways you can do that is with metadata. Metadata is “data about data.” In Laserfiche, it provides information about a stored document, such as the document creator, date/time of creation and document type, to name a few examples. Laserfiche metadata stores any information you provide or designate to a document or folder. Certain types of metadata—fields/templates, tags and links—make finding content in your repository faster and easier. Fields can be applied to documents and folders to provide identifying—and searchable—information that is useful in retrieving the item when it is needed. Grouping fields in templates makes them easier to associate with entries and one field can be reused in multiple templates. For example, the Fresno County Assessor-Recorder’s Office assigned the APN (unique document identifier) field to 17 different templates and the Book-Page field to five different templates. In order for entries to be searchable, field content should be relevant, thorough and accurate. Click the image to view a video of field creation in action. 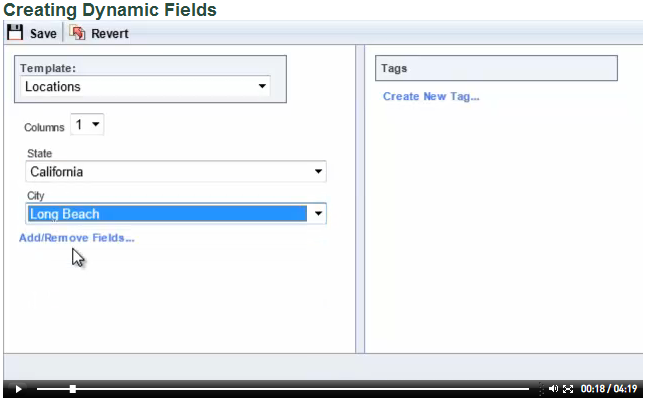 Dynamic fields simplify entering information into fields by forcing a user to select an option from a generated list based on other field values. For example, Eastmont Towers uses dynamic fields to help populate templates for patient charts. Click the image to view a video of dynamic fields in action. The Query Data activity in Laserfiche Workflow retrieves rows of data from an external SQL database and makes it available as tokens. These tokens can be used to populate fields. The Texas Higher Education Coordinating Board uses this method to populate templates for loan documents based on a lookup into the student database on Social Security Number. Lookup processes in Laserfiche Quick Fields retrieve information from a third-party database and store them in the processed document’s metadata. Cabarrus County, NC, uses the Lookup process to populate its check templates based on information stored in a Tyler Munis database. Certain fields can be set as required, which means that a document cannot be saved in Laserfiche until the field is filled out. 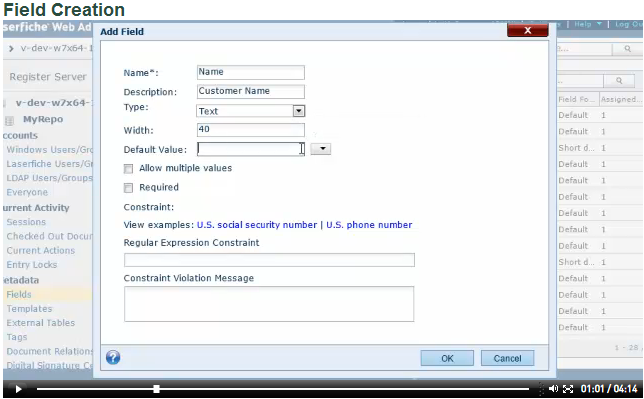 Field constraints require the person filling out the field to use a special format, such as a Social Security Number or a phone number. Michael Wells, Lead Computer Analyst at Chesterfield County, VA, recommends using field constraints to maximize data integrity. An informational tag can be applied to documents and folders to identify documents that share a particular trait. Searching by the tag can then quickly return the whole group. 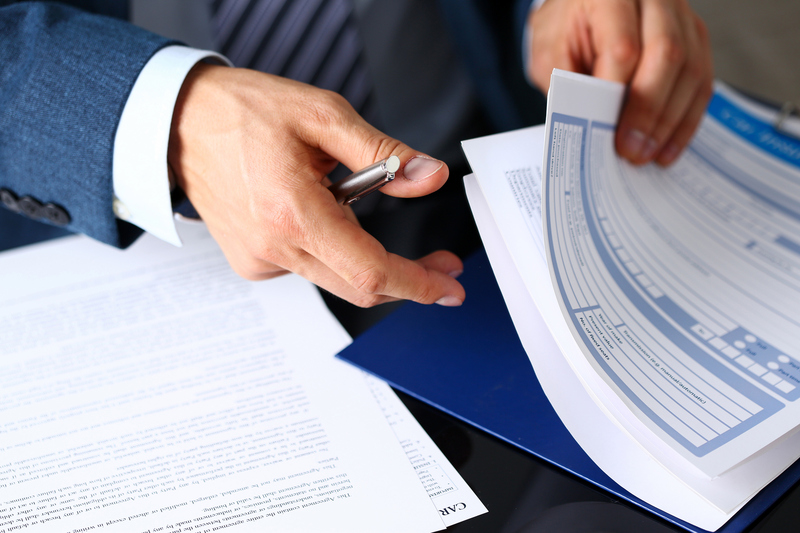 For example, all documents related to a particular project may reside in different places in the repository and have different templates associated with them. The City of Palm Beach, FL assigns a specific tag to each incoming revenue bond document. Searching by that tag will return all documents associated with the bond. 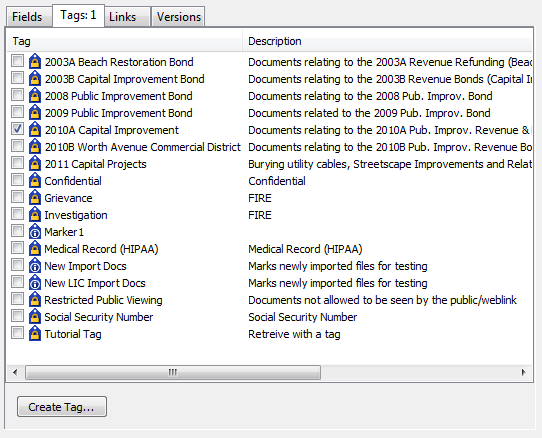 The tags metadata pane at Palm Beach, FL. Documents that match specific criteria can be automatically tagged by Laserfiche Workflow with the Assign Tags activity. 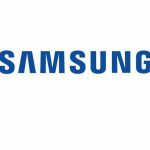 Document Management sofrware allow related documents to be accessed directly from within a particular document’s metadata tab. For example, a purchase order and invoice can reside in separate folders but can be linked together, as is the case at Associated Grocers, so that one document can be easily accessed from the metadata pane of another one. Search for and link related documents automatically with Laserfiche Workflow’s Create Link activity. The links metadata pane on an Associated Grocers invoice. So now that you’ve got the metadata set up accurately, go ahead and import all those documents into your Laserfiche repository. Retrieving them later should be easy and quick. Discover more solutions for Laserfiche, get your copy of “Quicker, Better, Safer: A Collection of Solutions to Document-Centric Business Process Problems.” today!